Published by : Cambridge University Press (Cambridge) Physical details: xv, 655 p. : ills ; 26 cm. ISBN:9781107034259 (hardback). Subject(s): Quantum computers. | Quantum communication. | Information theory -- Data processing. | Electronic data processing -- Technological innovations. | COMPUTERS / Security / Cryptography. Includes bibliographical references (pages 639-652) and index. Machine generated contents note: How to use this book; Acknowledgements; Part I. Introduction: 1. Concepts in quantum Shannon theory; 2. Classical Shannon theory; Part II. The Quantum Theory: 3. The noiseless quantum theory; 4. The noisy quantum theory; 5. The purified quantum theory; Part III. Unit Quantum Protocols: 6. Three unit quantum protocols; 7. Coherent protocols; 8. The unit resource capacity region; Part IV. Tools of Quantum Shannon Theory: 9. Distance measures; 10. Classical information and entropy; 11. 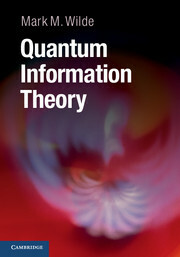 Quantum information and entropy; 12. The information of quantum channels; 13. Classical typicality; 14. Quantum typicality; 15. The packing lemma; 16. The covering lemma; Part V. Noiseless Quantum Shannon Theory: 17. Schumacher compression; 18. Entanglement concentration; Part VI. Noisy Quantum Shannon Theory: 19. Classical communication; 20. Entanglement-assisted classical communication; 21. Coherent communication with noisy resources; 22. Private classical communication; 23. Quantum communication; 24. Trading resources for communication; 25. Summary and outlook; Appendix A. Miscellaneous mathematics; Appendix B. Monotonicity of quantum relative entropy; References; Index.